OTTAWA—Falun Gong practitioners in Ottawa gathered across the street from the Chinese embassy at noon on July 20 to mark the 13th anniversary of the group’s persecution in China by the communist regime. Participants at the rally called for an end to the persecution of adherents of the spiritual belief, also called Falun Dafa. They also urged Foreign Affairs Minister John Baird, who is currently visiting China, to make a statement to his Chinese counterpart on the rights of Falun Gong practitioners and on Canada’s position on human rights and religious freedom. “Behind the façade of Starbucks and Apple stores lurks another ‘modern’ China, consisting of makeshift detention centres, labour camps, and solitary confinement cells filled with hundreds of thousands of Falun Gong practitioners,” said Lucy Zhou, reading from a statement representing practitioners across Canada. “Today, Falun Gong practitioners comprise the largest group of prisoners of conscience in China, and perhaps the world,” she said. She also referred to evidence from international investigations that Falun Gong prisoners have been killed for their organs. An extensive Canadian investigation was conducted by David Kilgour, former member of Parliament and Secretary of State for Asia-Pacific, along with international human rights lawyer and Order of Canada recipient David Matas. Their report and subsequent book, “Bloody Harvest,” detail substantive evidence that has been corroborated by other independent investigators. Zhou noted that the doctors performing these operations and all of China’s citizens are “among the persecution’s victims” who have been deceived by state-orchestrated hate propaganda into persecuting their fellow citizens. Ottawa practitioner Kathy Gilles said in an interview that she was at the event to give support to the practitioners in China who have suffered brutal oppression for 13 years. Yet they have continued to use peaceful means to resist and to explain the truth about the atrocities and the goodness of the spiritual discipline to fellow Chinese. Their courage has led to more and more Chinese citizens in recent months petitioning the authorities to release a Falun Gong friend or coworker arrested for his or her belief. “I have many words to say to the practitioners in China—gratitude mostly, and admiration for their strength,” said Gillis. Gillis is one of the artists of the Falun Gong Art of Zhen, Shan, Ren (Truth, Compassion, Tolerance) International Exhibition. 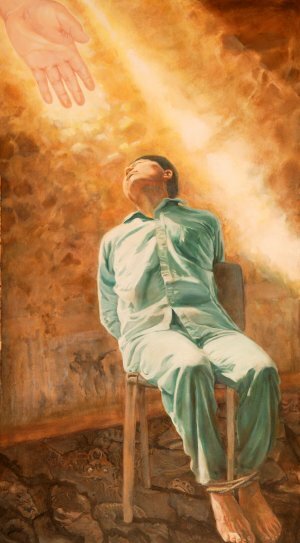 The exhibition, named after the three core principles of the spiritual practice, features paintings and sculptures by professional artists who practise Falun Gong. As these are the aspirations of concerned people around the world including Canadians, Gillis said she hopes Baird will convey the same message to Chinese authorities on his visit to China. “I’ve seen through 13 years of persecution and what practitioners in China have gone through,” said Hector Reyes, another Ottawa Falun Gong practitioner. “We have seen through many years of persecution of Falun Gong practitioners, Christians, Tibetans, and many other people,” he said.